This letter was written by Richard Franklin Underwood (1842-1918), a private in Co. F, 31st Massachusetts, who enlisted on 1 December 1861. Richard was the son of Charles S. Underwood (1801-1875) and Abilene Bennett (1809-1889) of Belchertown, Hampshire County, Massachusetts. He wrote the letter to his 15 year-old sister, Emma Jessie Underwood (1846-1895). Another sibling, Charles (“Charlie”) S. Underwood, Jr., is also mentioned in the letter. Richard later married 1st, Leona Maria Lyman (1849-1894), and 2nd, Myra L. Clark (1846-1922). The 31st Massachusetts was known as the “Western Bay State Regiment.” They were held in camp at Lowell, Massachusetts until February went they boarded a steamer at Boston and sailed to Ship Island. 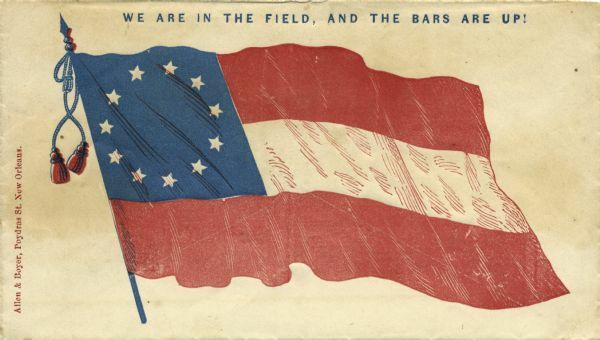 They were included in the operation against Forts St. Phillip and Jackson at the entrance of the mouth of the Mississippi River and were the first Union regiment to enter New Orleans. 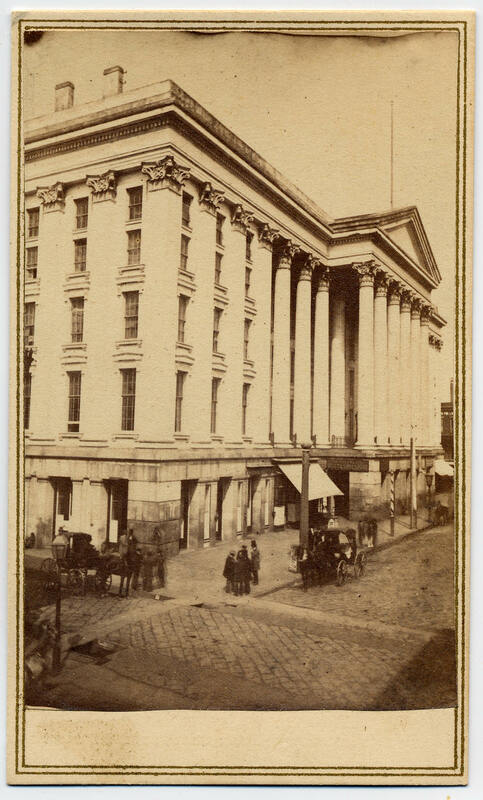 They remained in New Orleans on Provost duty until August 1862 during which time Richard wrote this letter — partially in red ink confiscated from the Custom House in New Orleans. From the letter we learn that Underwood’s company was bivouacked at a cotton press a short distance from downtown New Orleans and that on the night of 12 June 1862, the company was force marched after dark to the St. Charles Hotel in the city which had been seized and used as the headquarters of Major-General Benjamin Franklin Butler, Department of the Gulf. Though Underwood does not state the nature of the emergency, it may have been to quell a citizen’s riot in reaction to Gen. Butler’s General Order No. 41 issued two days earlier which required foreign citizens and consulates to declare their allegiance to the United States despite their neutral status. Richard survived the war and participated in the regiments campaigns until his discharge as a corporal in 1865. I received a letter from you yesterday dated May 10th. I am glad to hear that you are all well. I got two papers from home day before yesterday May 17th & 29th. I have received 8 or 9 papers. I am very glad to get them. My health is very good now — as well as most of the others in the company. We have not had any deaths in our company yet some of Co. F will get their discharges soon — one of them Old Robbins — Charlie knows him. I received a letter from George & one from Eristas some time ago. I have answered them. We do not have a very hard time here. We do not drill any. We have dress parade nearly every night which takes from twenty minutes to half an hour. We had the long roll last night after we had got well to sleep. Had to fall into line & march dow to the St. Charles — the General’s hotel — a mile & a half from here. We got into line & marched down in 38 minutes from the time the signal gun was fired. We have to go on guard once in four or five days so you see we do not have much to do. It is very warm here but we keep in the shade & keep cool. The ground is so warm in the middle of the day that we cannot go barefoot. I think we shall have to stay here this summer. I have got to stop now to work a little while in a cotton press ¹ clearing it out so we can have it for our quarters though most of us had rather stay in tents. I had to go on guard yesterday so I could not finish this till now. We have moved into our new quarters in the cotton press I spoke of. We now have a floor to sleep on and each one of us have had a mosquito ____ given out to us so I think we shall be quite comfortable nights. The mosquitos are a great bother down here in Dixie. We have had no pay yet but expect it soon. I sent Irenus four dollars from Lowell when I was there in a letter. Did he get it? I directed the letter to Ireland P. O., Holyoke. I have written to him once since. We have hired a band to play for us when we have dress parade or have any marching to do. It is easier to march by than the drums. Daniel Potter ² is tough and hearty. So is Harry Town. They both send their respects to our folks. The figs begin to get ripe down here. I have not eaten any yet. They are green when ripe & look like small pears. We have sweet potatoes once in a while for dinner. They are not so good as those you get up North. The fault may be in cooking. The molasses here is not so good as it is up there. The fig leaves are such shape and size as grape leaves. They would make very good clothes. We have lately drawn our dress coats so the regiment makes quite a respectable appearance on parade. I will send a small secesh flag (taken from an envelope) in this letter. Also a picayune ³ — the smallest piece of money in New Orleans. I sent two papers soon after we came to the city — secesh papers. The papers are all for the union now. Direct your letters to New Orleans. The direction on those you have sent is right. I have no stamps. Excuse mistakes. Give my respects to all the neighbors and to grandmother. This [red] ink we boys got at the Custom House. 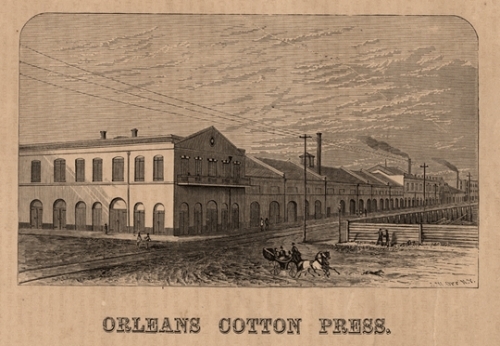 ¹ The Cotton Press that Co F of the 31st Massachusetts occupied during the summer of 1862 may have been the one that was located in the 1300 block of South Peters Street in New Orleans. A cotton press was used to bale the cotton before it was warehoused and/or sent to market. A cotton press was an early type of baler usually powered by two mules walking in a circle with each attached to an overhead arm that turned a huge wooden screw. The downward action of this screw compressed the processed cotton into a uniform bale-shaped wooden enclosure, where the bale was secured with twine. 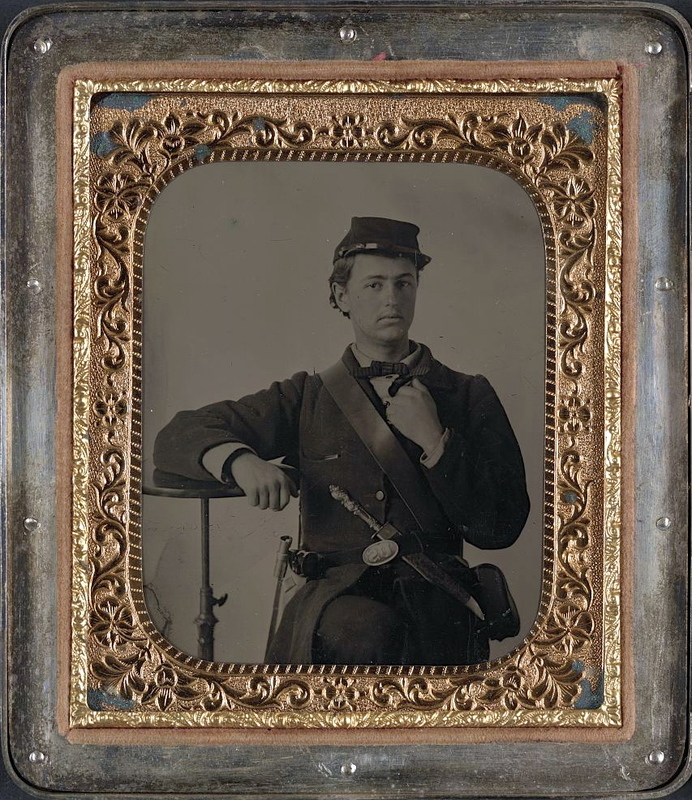 ² Daniel R. Potter served in Company C of the 31st Massachusetts.